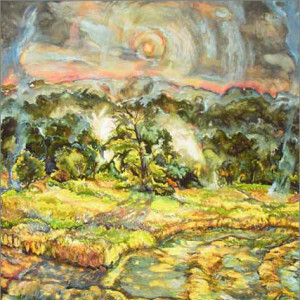 Evelyn Busch Klie is a painter who draws from the rural landscapes of Northern Pennsylvania and Southern New York. She has received numerous awards for her works, including the “Solo Show Award” from the Northeast Regional 2000, Artists as Visionaries, Contemporary Gallery, Marywood University, Scranton, PA; and the “Best Watercolor Award,” International Juried Show from the New Jersey Center for the Visual Arts, Summit, NJ. Klie lives and works in Windsor, NY.